PEEPS® brand candies have been a fan-favorite since 1953 with a variety of colorful and great-tasting marshmallow treats ideal for crafts, recipes or a holiday snack. Enjoy this Giant PEEPS Marshmallow Bunny on a stick, garnished with a fun design that is perfect for spring. A great addition to any Easter basket! PEEPS Decorated Marshmallow Eggs turn an ordinary Easter basket into something truly EGGStraordinary! 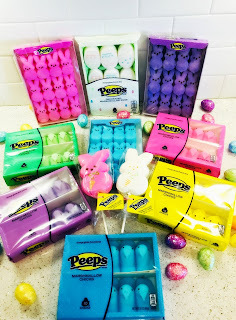 PEEPS Marshmallow Bunnies are the perfect addition to your Easter basket and a fan favorite for over 65 years. An Easter tradition, these delicious marshmallow treats are not only tasty, but a fun addition to holiday recipes or crafts. PEEPS Marshmallow Chicks are the perfect addition to your Easter basket and a fan favorite for over 65 years. An Easter tradition, these delicious marshmallow treats are not only tasty, but a fun addition to holiday recipes or crafts. It wouldn't be Easter without PEEPS chicks, bunnies and eggs! PEEPS are a must have in my house when it comes to Easter. Whether you use them as cute Easter basket additions or for baking, you can be sure they will be loved. PEEPS makes Easter complete! PEEPS Chick, Bunnies and Eggs are such a great addition to Easter. My kids also love the Peeps Easter Marshmallow Bunny Lollipops. They make a great replacement for those cute chocolate bunnies for those that don't love chocolate. PEEPS are a great way to help celebrate the season and are sure to please! Click HERE to find a store near you that sells PEEPS! Click HERE to learn more about PEEPS! Follow PEEPS on social media!